Arginine methyltransferase that can both catalyze the formation of omega-N monomethylarginine (MMA) and symmetrical dimethylarginine (sDMA), with a preference for the formation of MMA (1). Methylates histone H2A and H4 'Arg-3' during germ cell development. Methylates histone H3 'Arg-8', which may repress transcription (2). Recombinant human N-terminal Flag tagged PRMT5 was produced in SF9 insect cells, purified using FPLC and formulated in a storage buffer containing 20mM Tris-Cl pH 7.6, 1mM EDTA, 0.15 M NaCl, 10% glycerol, 0.5mM PMSF and 1mM DTT. Protein concentration was determined by spectrometry. >95% purity by SDS-PAGE. SDS-PAGE gel of recombinant Flag tagged PRMT5 (Lane 2). Lane 1, protein molecular weight marker. 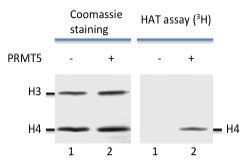 Recombinant human histone H3-H4 tetramers (2 μg) were acetylated in a 25-μl reaction containing 50 mM Tris HCl, pH 8.0, 10% glycerol, 0.1 mM EDTA, 1 mM DTT, 3 nM at 5 nCi/μl of [3H] acetyl-CoA (Amersham Pharmacia), and 0.2 pmol of purified recombinant FLAG-PRMT5. The mixture was incubated at 30°C for 1 h.